Who can relate: you introduce yourself to an acquaintance at a friend’s party. They ask you what you do for a living. You say you work in PR. You get a blank stare and most people respond with: oh so like advertising, or my personal favourite, you must spin the media. 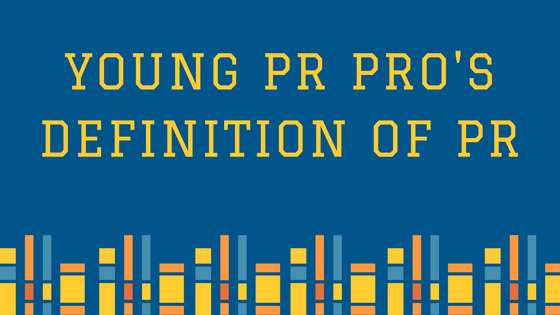 Well Young PR Pros has had enough, so we sat down as a team and put together our own definition. First, we reviewed a few definitions pulled from various sources online. Entrepreneur.com: using the news or business press to carry positive stories about your company or your products; cultivating a good relationship with local press representatives. Public relations is a strategic communications process to build and cultivate mutual beneficial relationships between organizations and their diverse publics, while remaining adaptable to the publics interests and needs, all to serve the greater good of our society. What do you think? Did we miss anything? Do you agree with our definition? If so, why or why not? Now that we have a definition, we need to know what skills are needed to fulfill this explanation of PR. Young PR Pros ran an online poll and asked you, the audience, what you thought the most important skills are for young professionals entering their first job? We closed with our favourite segment of the show, Lessons Learned. But, we want to hear from you. What did you learn this week? Share your opinions by writing a comment below, or on our Facebook Page, send us an email or audio note at youngprpros@gmail.com, or send us a message on Twitter @youngprpros. Do you have plans this summer? Don’t forget to visit youngprpros.ca and catch up on old episodes. Go back to class September with fresh new ideas and succeed in your career. This entry was posted in Young PR Pros podcast and tagged advice, career, clare bonnyman, communications, definition, job, jobs, julia kent, kentjulia, kristine d'arbelles, PR, public relations, ross simmonds, young pr pros, young pros by Kristine D'Arbelles. Bookmark the permalink. Next → Next post: Young PR Pros wants to hear from you!